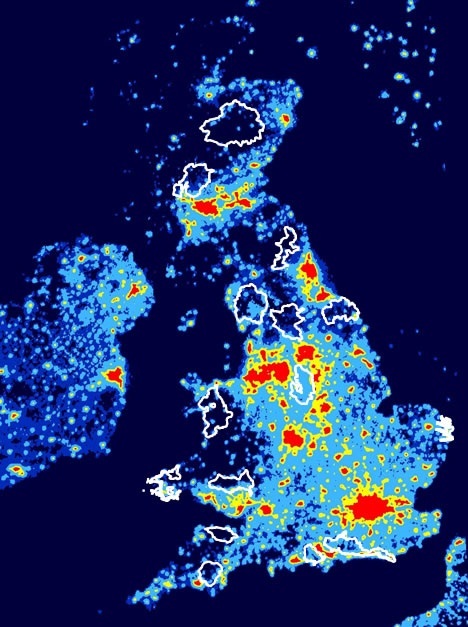 Did you know that the UK has some of the largest areas of dark sky in Europe? This means there are large areas which are completely free from local light pollution and so it's a fantastic place to start your stargazing adventure. Many of the UK's darkest areas can be found in the National Parks as you can see on the map. The Yorkshire Dales National Park is special for many reasons, both during the day and especially at night, as it is the third darkest sky in the UK. Under this really dark sky you can see up to 2,000 stars and we can even see our own galaxy and The Milky Way stretching across the sky. 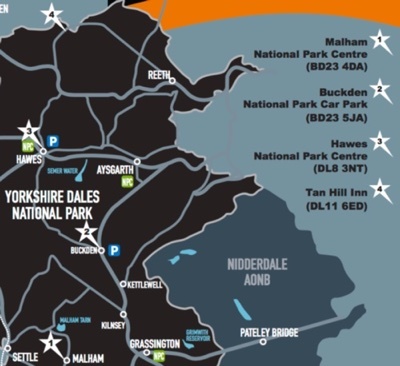 The Yorkshire Dales National Park are so proud of our night time skies that we are celebrating with the fourth Dark Skies Festival which will be held from 15 February - 3 March 2019. A whole new half term experience awaits at - Experience awesome planetariums, night runs, magical moonlit walks, celestial stargazing parties, night-time bike rides, planet trails, movie nights, nocturnal bushcraft, starry night kids' crafts & amazing rocket making - many of which are free and accessible. * 'Stargazing 2019' the month by month guide to what you can see in the Dark Sky across the UK - your own copy to take home. * Our own Dark Skies package - tuition & use of a telescope to view one of the darkest skies in the UK where you can view star clusters, nebulas & even the Milky Way! * Stay the weekend of Friday 22 February & enjoy a free planetarium experience too. * Stay at The Dairy & the accommodation & the above activities are fully accessible too! There are additional events either side of the festival happening throughout the winter and early spring from January to April. * Star Gazing Guide Book - month by month guide as to what to see in the Dark Sky every single night! Take a look at the Yorkshire Dales National Park's Stargazing leaflet for top tips on viewing the sky at night, what to look for and when. There are many places in the Yorkshire Dales National Park that are great for stargazing. The more remote you are from light sources such as street lights, the better. These are locations that are defined as being open to the public, accessible to all abilities and provide parking and other facilities, and are a great place to begin. On a clear night you could see as many as 2,000 stars. In most places it is possible to see the Milky Way as well as the planets, meteors - and not forgetting the Moon. You might even catch the Northern Lights when activity and conditions are right, as well as the International Space Station travelling at 17,000mph overhead. The Northern Lights / Aurora Borealis? AuroraWatchUK is the ideal way to receive alerts when the scientists are predicting it might be possible to see the Northern Lights (or Aurora Borealis) in the UK. You can follow them on Twitter or download an app for your phone. The Northern Lights can only be predicted a few hours before they occur and when activity peaks you need to be ready to go! August sees the annual Perseid meteor shower when, at its peak, hundreds of meteors an hour can be seen. Meteor showers happen at predictable times throughout the year and information can be found on a variety of websites such as Time and Date. Sky Week has a comprehensive guide to what you can see in the night sky this week. Pocket Universe is an app with plenty of features and star maps. Stellarium is an excellent free planetarium program which gives you a real time view of the night sky and can be loaded onto a PC, phone or tablet. The very darkest skies occur at the time of the New Moon - two weeks after Full Moon. However, the Moon itself is a great object to take a closer look at, especially when its full. Time and Date has details of when the phases of the Moon will occur. The ISS (which recently had British astronaut Major Time Peake on board) will pass overhead often throughout the year. In fact, it orbits the Earth every 90 minutes. To find out when you might see it in your location, visit NASA or download the ISS spotting app. What's happening soon in the Dark Sky? Take a look at Dark Sky UK to find out about upcoming events in the dark sky in the UK. We would like to thank it's author Richard Darn (pictured with Diane above), astronomer and media consultant, for helping Cottage in the Dales with recommendations about what telescope and bincoulars are best to get started with stargazing for our guests, for use of some excellent photos and for the interesting and passionate talks he gives to anyone - individuals and businesses - who are interested in learning more about the Dark Skies above the UK. Richard is so inspiring!